Looking for a great gift this Christmas? This book is perfect for the imaginative and slightly romantic teen or young adult. The story's plot concerns a mermaid and a winged boy. The mermaid, Esmerine, is destined to become a siren. She has doubts about where she wants to be in life. When Esmerine's sister disappears into the night, seemingly to go follow a human boy, Esmerine follows her both to help save her sister and possibly get a last look at the human world. There is, however, one problem with mermaids walking on land-whenever a mermaid walks on land, she experiences sharp, stabbing pains in her legs. Esmerine pushes past the pain to find her sister and ends up finding Alandare, an old friend, first. Alandare, still the slightly stuffy and mature Fandarsee (winged race). He does agree to help her, but not before extolling the ridiculousness of the task. The story takes off from here. I loved Esmerine's character. She was inquisitive, smart, and compassionate. There was always an air of magical intent surrounding her. Alandare, though he acted older than he was, was intelligent, kind, and clearly happy with Esmerine. The secondary characters will stand out to the reader, the author instills them with different characteristics that will likely remain memorable to the reader. The events of this book were fast-paced and the book is far too good to put down. A reader will most likely finish this book within a day or two. The ending was perfect, the author did a great job tying up loose ends. This book is highly recommended to teens/young adults/young at heart. 1) What was your inspiration for a story about a boy who flies and a mermaid? I've had this story in my mind for a while, although the specifics have changed. I've always been a sucker for stories about people falling in love despite physical differences, particularly of a breed you can only find in speculative fiction where two different species have fallen in love. I'm not sure why this draws me in so much, but it does. I guess there's something a little heartbreaking to me about a boy who can fly and a girl who can swim, neither of them can ever really fully share the other's world. But at the same time I find the attempt to overcome those differences so sweet. 2) Who was the hardest character to create and write about? Probably Dosinia. I'm very responsible and careful and she does this impulsive thing by running off with a human. I've known plenty of girls who would do crazy things like that but I guess I don't really understand it! 3) Are any of the characters based on people you know or yourself? Well, there certainly is a little bit of me in all of my leads, but not particularly so. I'm probably more Alan than Esmerine, although in my first book I was more Nimira than Erris. 4) What was your favorite chapter to write and why? 5) The cover is amazing, did you have any input concerning the cover? No, not really. I mean, they showed it to me before it was final so if I'd been like, "UGH" they might have taken that into consideration, but I LOVED it from the first look. 6) Why should readers pick up your book? 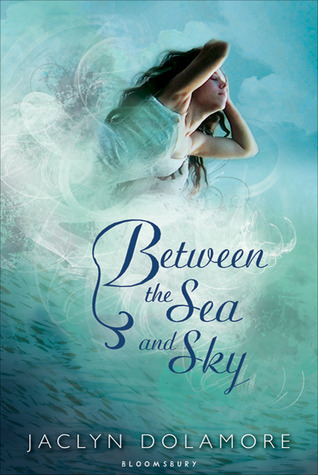 If you would like a change from dark paranormals and drawn-out series, Between the Sea and Sky is a romantic standalone that will hopefully brighten a dreary day and pair well with a cup of tea. 7) Are you already working on another book? Yes! A dark paranormal drawn-out series! Well, okay, not really, but I do have two darker, more horror-tinged books coming up, the first of which is Dark Metropolis in 2013. This guest post/review is thanks to Kate Lied at Bloomsbury. I am intrigued by the romantic interest being between two beings that already have a hard path based on their race let alone the challenge of adventure to find her sister.